The U.A. Whitaker College of Engineering hosted the American Society of Civil Engineer’s (ASCE) Excellence in Civil Engineering Education (ExCEEd) Teaching Workshop in June, 2015. By clicking on this link you are being re-directed to a non-FGCU site. STEM@Work is a partnership between The Foundation for Lee County Public Schools and The School District of Lee County. STEM@Work students across Lee County worked in teams to design their best tennis-ball launching catapults using the knowledge they’ve gained in science, technology, engineering and math during this past year. ASCE Student Chapter has been selected by the Committee on Student Members to receive a Letter of Honorable Mention for its outstanding activities as recorded in the 2014 Chapter Annual Report. This is recognition received by only the top third of all Student Organizations. from 2:00pm – 6:00pm in the recreation fields next to the dirt parking lot. Engineering Students WIN the “Titanic” Award! The Scarlet Dagger (37 feet, 600 lbs), constructed by approx. 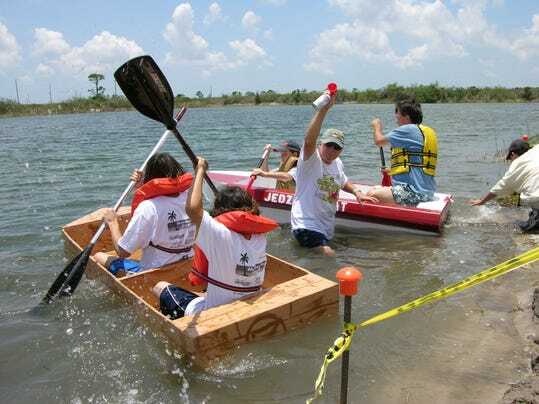 20 FGCU students was the largest ship in Cape Coral’s 19th Cardboard Boat Regatta Competition. Students wore pirate regalia and lobbed water balloons at their competitors. “We had a blast, regardless of the outcome” said Kyle Binninger. A good time was had by all and money was raised for a good cause. CLICK on LINK for full story in The News-Press. This internship program is designed to provide qualified students in the Environmental/Civil engineering programs with additional engineering work experience outside of and in addition to the classroom environment.